The more time you spend in the woods the more you realize that you can go without many of the creature comforts you think you "need". Traveling light and shedding unnecessary gear will make any back-country outing more enjoyable, and your back will thank you later. 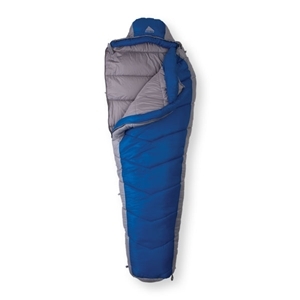 On the short list of true necessities is a good sleeping bag, and Kelty makes some of the finest. The Light Year XP 20 is a great 3 season bag, providing a comfortable nights sleep in a huge range of temperatures. From early spring ventures with temps near freezing, to mid summer trips this bag is designed to cover all the bases. The spacious mummy style design with a form fitting hood keeps the cold at bay. When temps rise you can make adjustments with the zippered side and foot vents. Ample interior and exterior loops provide attachment points for a sleeping pad or to use this bag as bag liner. Stuffed into its own compression sack the Light Year XP 20 shrinks down to a 10" x 18" cylinder and weighs in at just over 3 pounds.